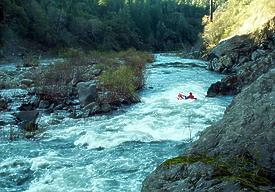 This easy stretch of the South Fork of the Eel is quite beautiful for a river near a major highway. The water remains green and relatively clear even after major rainstorms. 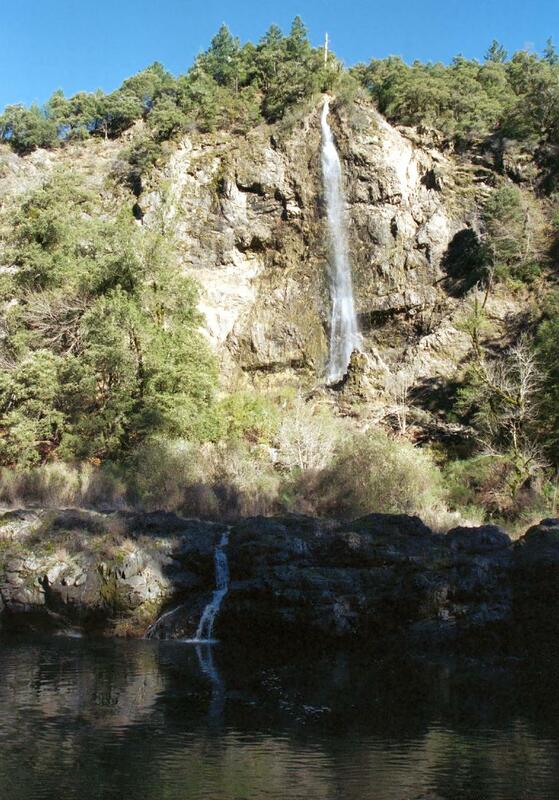 As a bonus, you can see a Yosemite-class waterfall. If the Leggett gauge is not reporting, estimate 40% of the flow at Miranda. Put in at Big Bend Lodge. In 2010 the put-in fee was $10 per person, or $25 per vehicle, and shuttle service was available at the Lodge, both upriver and downriver. Cottages with hot showers and kitchens are available at reasonable rates, and include river access, a short carry over a gravel bar down to the river. 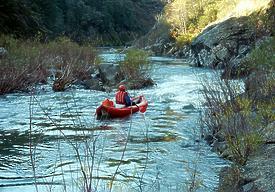 For reservations call 707-925-2440 or visit bigbendlodge.com. 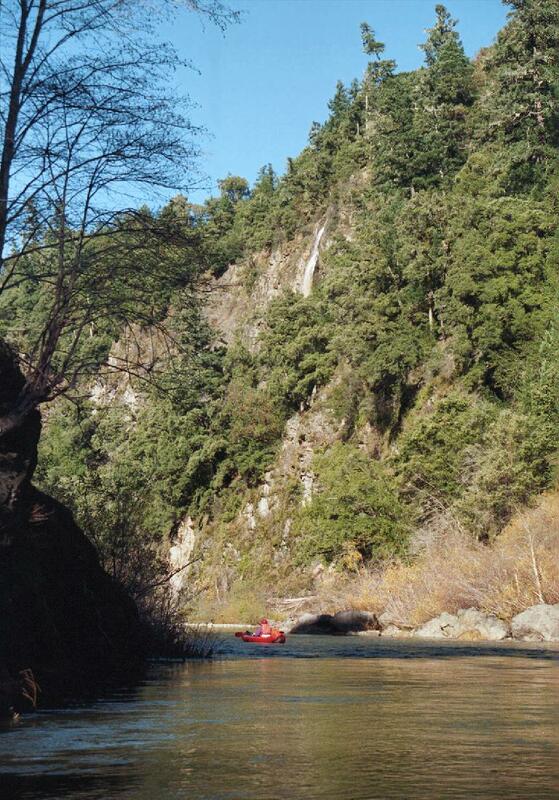 On the right, Grizzly Creek Falls plunges from a rocky plateau almost 1000 feet into the river. Highway 1 bridge crosses overhead near the town of Leggett. With steep banks and no significant beach, access is poor. Hazard! There is a persistent caved-in bank with downed trees on the right side just before the bridge (2000). The river passes thru Standish Hickey State Park, where a low-water bridge is installed in summertime, but not during boating season. Houses and satellite dishes appear on the right bank, and one of the rapids in this section is steeper and requires more maneuvering than others. Poised at the brink of the big one A rather large hole for a class II+ rapid! Take out on the right at Redwood Flat, a large grove of redwoods on a bench just above the river. A parking lot is supposed to be available, although it was closed by flooding in 1998. There are many other access points downstream; perhaps the best one is where the river approaches highway 101 where a sidestream goes under a concrete bridge. 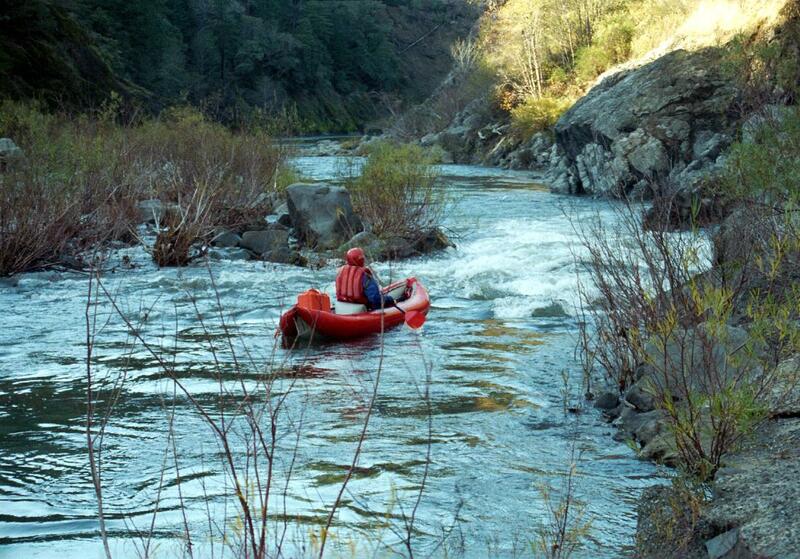 Between Redwood Flat and there, you encounter a long and intricate boulder garden, which was my personal favorite rapid on this run (December 1999). To reach take-out, drive about 4 miles north of Standish Hickey State Park to where the road descends to near the river. There is a parking lot near a large stand of redwood trees, called Redwood Flat, part of Smithe Redwoods State Reserve. To reach put-in, drive south of Leggett to the top of the hill, and exit on the parallel sideroad (sometimes called Drive-Thru Tree Road, once known as highway 271). Drive south on this windy road until you see a small sign on the right saying Big Bend. Bear right and descend on this rock-strewn dirt road to the river. To reach the Humboldt county line bridge from on highway 101, take the Cooks Valley exit and park at the green bridge in the south side pullout.